Remove the skin from garlic cloves and grind them coarsely. Soak the tamarind in warm water for 10 minutes. Kneading with your fingertips extract the tamarind juice and discard the pulp. Take a deep vessel and add the tamarind juice along with garlic paste, turmeric powder, coriander Powder, pepper powder and salt. Mix well and bring it to a boil over medium flame. When Rasam begin to boil, add 3 cups of water. Heat oil in a small pan; add the mustard seeds. When they begin to splutter, add the cumin seeds, curry leaves and broken dry red chillies. Fry them for a minute and add this seasoning mixture into the rasam. Adjust the salt and let it simmer for few more minutes until the rasam is frothy. 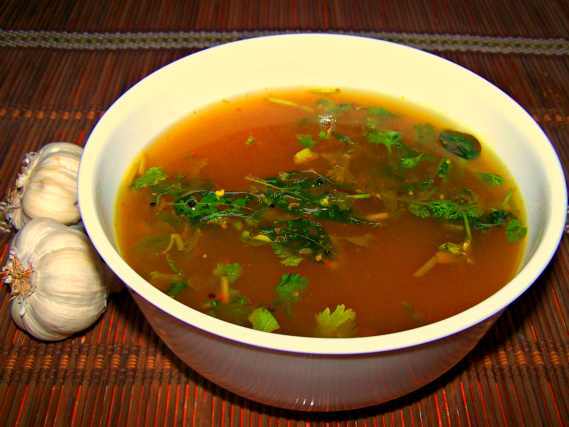 Garnish with finely chopped coriander leaves and serve it hot.